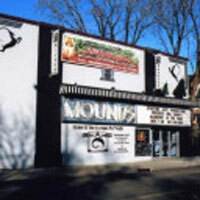 The Mounds Theatre was originally built in 1922 as a venue for silent movies and live entertainment. It was renovated around 1933 and 1950 before closing in July 1967, and used as a warehouse until December 2001. In 2001, the theatre was donated to the Portage for Youth by George Hardenbergh to address unmet needs of youth and families on St. Paul's East Side. Portage director Raeann Ruth led the renovation project and, with the help of a STAR grant through the City of St. Paul and a donation from an anonymous donor, the Mounds Theatre became the art deco landmark it is today.